Jürgen Bartsch was a German serial killer who sexually assaulted and murdered four boys and attempted to kill another. His case was the first in German history to include the psycho-social factors of the defendant in its consideration of sentence. He was initially sentenced to life imprisonment but this was reduced on appeal to 10 years of juvenile detention and Bartsch was placed under psychiatric care. 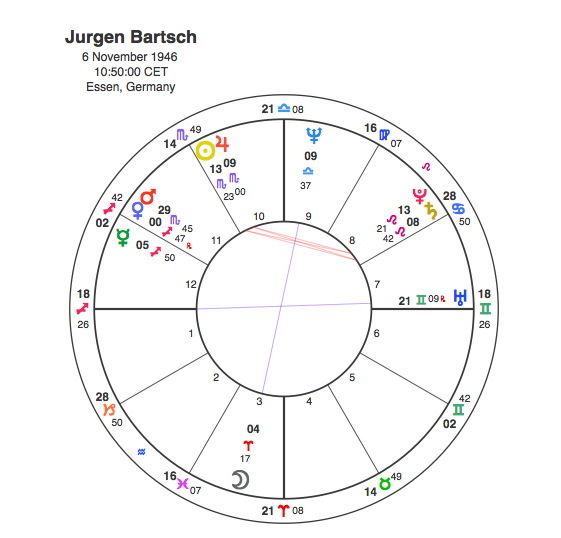 Bartsch had a Scorpio Sun but the thing that turned him into a killer was an exact square from the Sun to Pluto which itself was conjunct Saturn in the 8th house of death. In astrology the closer the aspect the more powerful the effect. A square aspect can be up to 10 degrees but Bartsch’s Sun and Pluto are separated by a mere 2 minutes. Another important feature of his chart was the Moon in Aries opposite Neptune. The Moon in Aries would add a short temper to this equation but the opposition to Neptune caused a number of issues in his upbringing. The Moon rules a person’s mother and Neptune’s opposition would point to an erosion of the natural maternal principle in his life. Bartsch’s mother died soon after his birth. His adoptive parents were extremely strict and the mother suffered from obsessive-compulsive disorder and was fixated on cleanliness. He was not permitted to play with other children, lest he become dirty. As Bartsch only lived for 30 years he would not have any Pluto / Sun transits. In this case the most powerful transits of his life would be to the Moon and the Ascendant. Jurgen Bartsch was arrested for the murders in 1966 and sentenced to life the following year. Pluto was square to his Ascendant from 1966 – 67. Pluto’s opposition to his Moon gave him a chance to address some of the emotional issues that arose from his chart when he married in 1973 whilst still in psychiatric care. This chance was taken away from him in 1976 as Pluto reached the other end of the Moon’s opposition by conjuncting Neptune. Neptune rules intoxication and Bartsch agreed to voluntary castration in 1976 in order to avoid lifetime incarceration in a mental hospital. During the operation Bartsch was given an accidental overdose by an insufficiently trained nurse which killed him. Jurgen Bartsch was yet another testimony to the brutal and tragic power of Pluto.